We have now had several weeks of very hot weather and this is not enjoyed by some of our cool mountain orchids. Renathera imshcootiana on the other hand is loving the sun and the warmth. 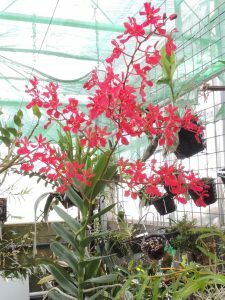 This amazing red relative of Vanda is unfortunately one of the orchid species threatened by the trade in unsustainable wild collection. It is native to the Eastern Himalayas where it grows in warm evergreen forest along rivers from 500 to 1000m. 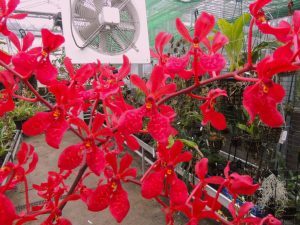 Fortunately like most tropical epiphytic orchids it is easy to grow from seed to make the species common in cultivation and so reduce the pressure for wild collection. 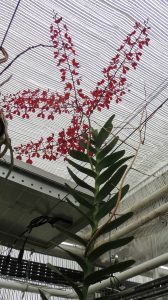 The species grows as a single stem with stiff 15cm alternate leaves making a very stately plant with the most dramatic red flowers (the photographs do not do the colour justice) on long branched spikes. The flowers are long lasting and this plant has been blooming since early June when it won an award at the Malvern Show.